Where the growth is. 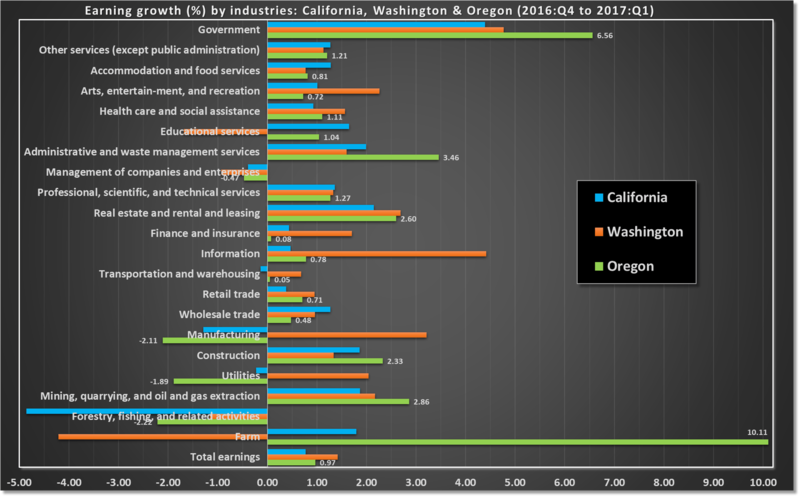 Earning growth (%) by industries for Oregon, Washington & California in Q1, 2017. The fastest growing industry across these three states is Government (despite Trump administration’s strong focus on reducing size of government). One would expect technology and information to be the leading industries in these states that are known for Amazon, Microsoft, Intel and Silicon Valley, but most growth is in administrative & farm jobs. Oregon’s biggest growth is in farming followed by government & administration. Both Washington & Oregon are seeing a population growth, but they are certainly not moving to high tech industries. Source: Bureau of Economic Analysis, www.bea.gov (data, in excel).